I think that i am thinking that way too as the symptoms seem to be getting worse! No i have been caught out with a lift pump and a water pump on my last disco in the dreaded Blue Boxes so wouldnt ever use their stuff. The gasket i used was a MLS genuine Landrover main dealer part at 37.00 beer tokens, and genuine headbolts. And yes the block surface was spotless and the head was brand new from a reputable engine company. The gasket i took off was a genuine composite , and had no visible signs off failure,and the head was the original landrover one, which is down being checked for warping and pressure testing, so i can keep as a spare. Thanks again, looks like its head off time again, unless anyone else has any other sugestions. Hi mate sounds like the cooling systems working what you checked the oil cooler hoses and the oil cooler therostat as that to overheat the engine quite quick or the oil cooler blockage ?? The oil cooler is new on the rad, and plenty of oil came out when i took the rad out the other day, the oil cooler pipes are genuine new about 8 months ago, the oil cooler thermostat? think must be working otherwise oil would not be going in to the oil cooler? If you have the head off, take the opportunity to blow through all tehe water ways really well with an airline, can only help! Have you checked the gauge? Did that last time it was off but will do again. Someone mentioned about a small breather hole in the block? Any ideas apparently its about 3mm big but i dont remember seeing it last time? Also is there a drain tap in the block to get every last drop of old water out? The fuel filter is new and fuel lift pump is new. Air filter about 3 months old. It has got a snorkle fitted so maybee i will take it off and go for a run. The exhaust is only a centre box with a new decat front pipe and a straight through pipe at the rear, but its worth a go , i will take it off and go for a run. Boost presure rises steadily with aplication of power, and stays rock solid at maximum boost. No i havent checked the gauge , but when i open the bonnet when its got hot on the gauge, you can feel how hot it is under the bonnet , so i think its working ok.
To overheat a TDi something major must be wrong. The cooling system is designed to cope with a heavily laden vehicle towing a fully laden trailer across a desert in 50 degree heat. I have done exactly this without a fan . It was fine until I hit a mountain - then I had to pull over and fit the viscous. To overheat in this weather, something must be nearly totally constricting the water flow around the cooling system. I agree there must be a serious fault but where? I do not know where else to look or try? I havent had a chance to take the head off again yet, but that is going to be my next step unless someone comes up with a brain wave. Question:- Where is the drain tap/plug on the block so i can flush and blow it completely out? Still following this thread with interest! Specifically " Belts & hoses - Check belt tension and condition. A loose belt that slips may prevent the water pump from circulating coolant fast enough and/or the fan from turning fast for proper cooling. The condition of the hoses should also be checked and replaced if they are over 5 years old." 2. Lower Radiator Hose collapsing (part No. 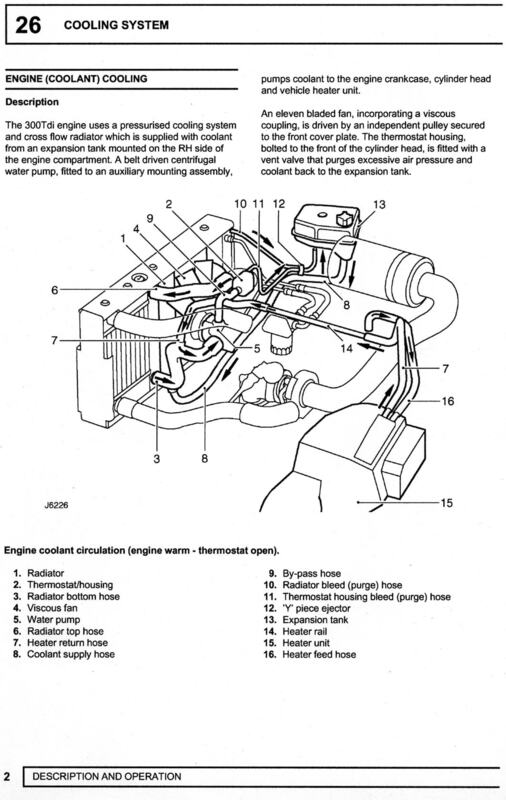 ESR3296 ) (from same site above): "Sometimes a lower radiator hose will collapse under vacuum at high speed and restrict the flow of coolant from the radiator into the engine. This can happen if the reinforcing spring inside the hose is missing or damaged." Or if the hose is made by Britpart? The lower radiator hose is another often overlooked source of high RPM cooling problems. As the water pump speed increases, the pressure inside the lower hose can become very low, as the water must be drawn thru the radiator core. If water flow becomes high enough, the core can become a restriction. When the restriction becomes large enough, the system pressure between the radiator core and the water pump can get low enough to allow the hose to COLLAPSE !!! If the hose collapses, no flow is happening, and overheating is the only outcome. Most lower (or suction side) radiator hoses come with a spiral wound "spring" like coil inside it's length, which is typically made of stainless wire. If your lower hose does not have one, get one. Even if your hose feels stiff without one, it will become quite soft as the coolant temperature goes up. 3. Replace Expansion Tank Pressure Cap. "Higher system pressures raise the vapor point of the coolant and subsequently it's ability to absorb heat. A system pressure of 12-17 PSI results from the expansion of the coolant and trapped air going from ambient temperature to operating temperature. " I reckon number "2" would be your best bet.. In the words of Sherlock Holmes: "When you have eliminated the impossible, whatever remains, however improbable, must be the truth?" Interesting the above on radiator hoses. I remember somewhere in this thread you mentioned that you have silicone replacements? I'm afraid I can't help with the location of the drain plug. I guess it must be on the side at about the same level as the bottom of the cylinders. 2. Lower Radiator Hose collapsing (part No. [/font]ESR3296 ) (from same site above): "Sometimes a lower radiator hose will collapse under vacuum at high speed and restrict the flow of coolant from the radiator into the engine. This can happen if the reinforcing spring inside the hose is missing or damaged." Or if the hose is made by Britpart? I have just been outside to check and the bottom Silicon hose does not have a spring inside!!!!!!!!! I too think that this is very probable as the silcon bottom hose DOES NOT have a spring in it. Yes, that does seem to fit quite well. I can imagine silicone going quite floppy when hot too. The head that was fitted was brand new so no skim. Tony - I've actually got a spare bottom hose in my garage (part: ESR3296) - which I've just checked. As mentioned by "mayur" - it indeed does NOT have a spring inside (mine is a Britpart one - ahem ). Anyway.. that aside, you mentioned you had fitted Silicone hoses to the radiator... Presume these are a different design to the standard ones? My point being - it may be worth fitting the standard bottom hose anyway... just a thought. I suspect that rather than a spring, the hose is re-enforced with a fibre composite of some type. Well...all the ones I've ever cut up have been. That'll give it some rigidity, and I'd expect it not to change shape when hot. I believe the hoses are the only part you haven't checked yet.